Here are some updates on Works projects happening around the Shire. Tenders closed last week for the delivery of architectural services for the design of the Golden Plains Community and Civic Centre (Bannockburn office redevelopment). We will now focus on reviewing the submitted tenders to find the most suitable. The tender for delivery of architectural services for the Bannockburn Heart closes this week. It will be an extremely busy period for the staff managing both Bannockburn Heart and the Golden Plains Community and Civic Centre as they are both very significant projects for Council and the community. Pictured in the header image of this page. 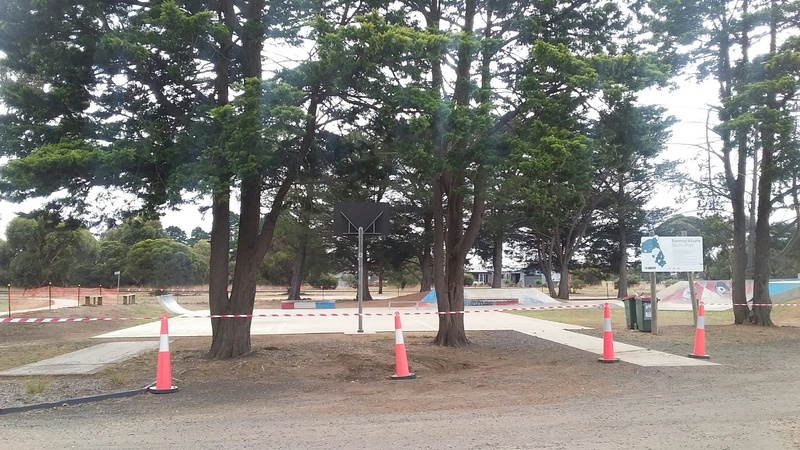 It was all hands on deck for the Townships Maintenance team in preparation for Barwon South West competition at Bannockburn Skate Park, which is a great annual event for the community and Council. Not only did this involve a significant clean-up of the material stockpiles in the area, but also set-up of the skate park facilities for this year’s competition. The Outdoor Works team is currently working with the Bannockburn Community Planning Group (a group of local volunteers) to come up with a plan to beautify Milton Street, Bannockburn through nature strip planting. Staff will work with the passionate members of the group to determine the type(s) of trees and best locations for plantings. The partnership will also determine in-kind support as well as ongoing maintenance until the trees are established. It is always great hearing about volunteer-driven Community Planning projects. Council has been grading Old Mill Road in Bannockburn and will be working through the Bannockburn area over the next few weeks. We will have a full crew of graders on the gravel road maintenance program shortly with the current capital works projects at Gumley Road (Mount Mercer) and Meredith-Mount Mercer Road being completed. A grader has also started in the north of the Shire on Tuesday, 10 April. For more information about road grading, please call 5220 7111. As Golden Plains Shire’s towns grow bigger, so does the township infrastructure and the need for increased maintenance. In the past we have brought in contractors when street-sweeping services were needed, but with the growth of our towns (which affects the tidiness of our streets), we determined it is best to look into the purchase of a small street sweeper. We can easily transport the vehicle to townships for sweeping and will be able to keep our communities cleaner, as having our own sweeper will enable us to provide a higher level of service. As contractors can be costly, a Council street sweeper will be a cost-effective way for Golden Plains to maintain our lovely townships. We have not yet purchased the equipment – we are currently sourcing pricing from the Municipal Association of Victoria, but we look forward to getting the sweeper and seeing the difference in our townships.